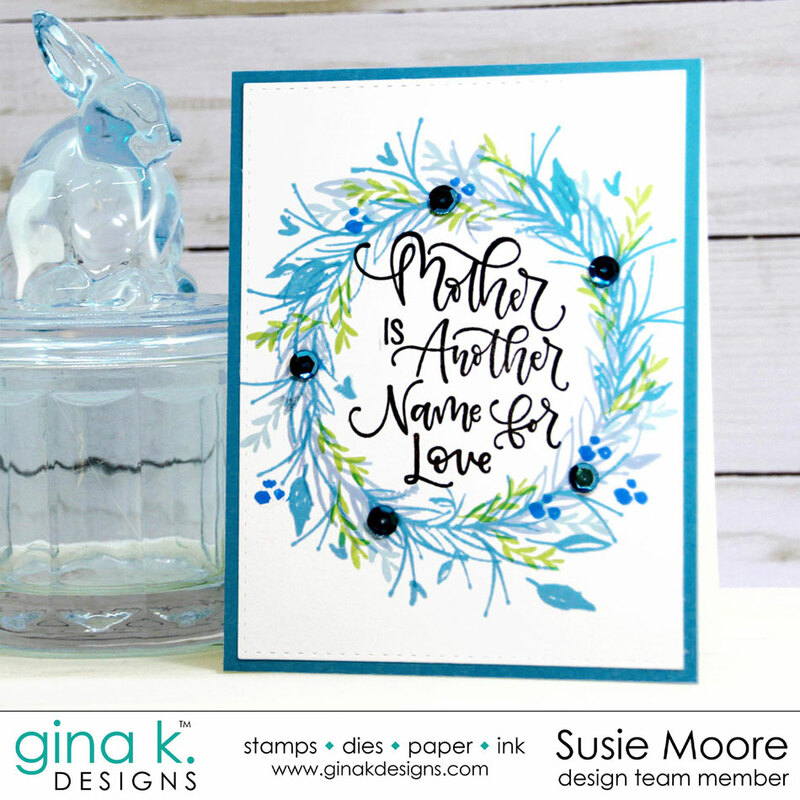 Welcome to the final day of our Gina K. Designs March previews. Our release party will go live at StampTV at seven tonight and you are in for a treat. All of the design team members and illustrators will be along to visit with you and share cards for the new release which will be live by then. 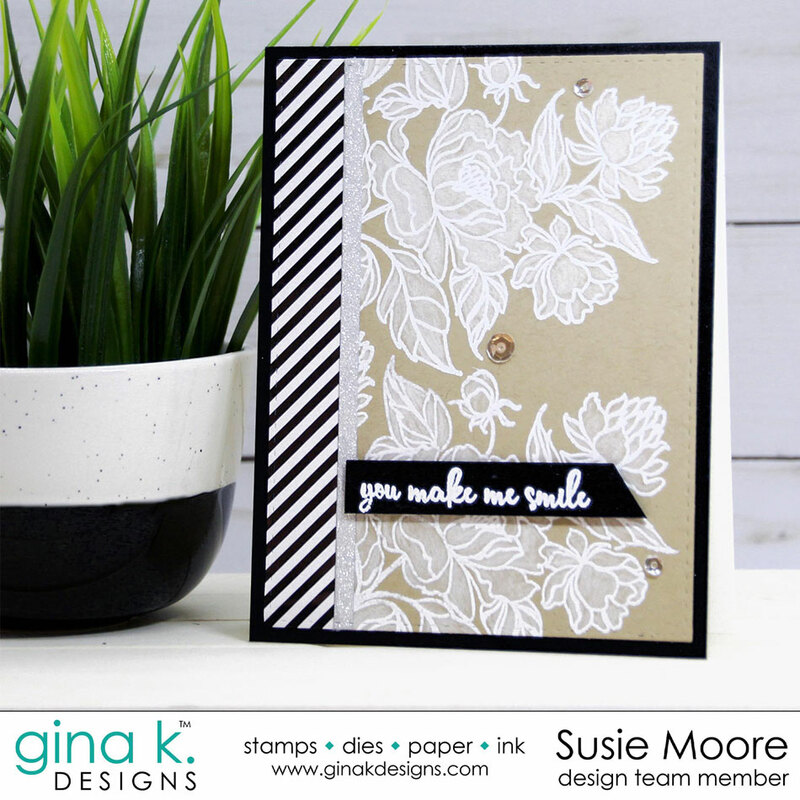 Gina K. is first up today with her new set called, You Make Me Smile. You are going to love this set and it is one you will go back to often I think. The card above is just one of the projects I've been working on using this set. I love using white heat embossing and a white pencil on kraft card stock. I think the flowers look like they are made from vellum. Next we have a first time set by the very talented illustrator, Emily Schroepfer. This set is aptly named, Lettered and Lovely. Here is a card I made using her beautiful lettering I also used some of Lisa Hetrick's gorgeous stamps (You Are) to make a wreath surrounding the sentiment. For each day's preview there has been a $50.00 Gina K. Designs gift certificate giveaway and that continues today! You could be a winner by visiting and commenting on each designer's post (links below). We will announce the winners at the release party tonight so be sure to comment before the party to be in the running for this great prize! Thank you so much for stopping by my blog these past few days. I hope you'll visit me again tomorrow. I post new inspiration every day and I'd love to share it with you! Awesome cards!!! Colors are great!!! That first card is very, very pretty with the cream and white. I always forget about that combination. Your second card made me miss my mother - that is okay though. The card and sentiment are beautiful! i have gasped on every stop today on the hop. What you and the design team have done with these stamp sets takes my break away! Gorgeous cards! The first card is very elegant. I really like how you you did the wreath builder card. You’ve inspired me for my next card. I love your cards, especially the blue wreath one. It is absolutely gorgeous. Thanks for sharing. Amazing cards. Thank you for such beautiful inspiration! These are wonderful. The black and white is so striking, must try that. Thanks for sharing. Your white on kraft card looks so much lace. It's gorgeous. I forget how beautiful simple white on kraft looks. Your second card is just stunning! Congratulations on your win!!!!!!!!!!! How happy of a dance are you doing? How beautiful! Wow! You are remarkable! I have loved each and every card you've ever made. Fantastic cards! I love the white on the kraft cardstock! I was all set to tell you how much I loved your first card, the white on kraft, and then I saw your second card, and now I'm not sure which I love more! They are both beautiful in their own ways! Your first card looks like beautiful lace. Lisa Hetrick's You Are stamp set is one of my favorites and you used gorgeous colors with it. Beautiful cards - both of them! The flowers on the first DO look like vellum =) The wreath in the second is beautiful. Thank you for inspiring!!! Gorgeous cards. The blue is Beautiful. I love that card!! Love the flowers in white on the kraft paper! And a gorgeous wreath and sentiment on your second card! Awesome colors on your wreath! Lovely cards. Thanks for sharing your ideas. Oh, wow. I love the colors you chose for your wreath. The blue is so different and fresh!!! I did not get Lisa's stamp set but boy I wanted to. And seeing new designs makes me want it still. What a cute card with that wreath from her set. This new release looks like I need to win some money somehow. Beautiful white and kraft design. And, I love the pretty wreath card as well. Beautiful cards! I love the white on kraft look, it's lovely. The wreath is beautiful, the shades of blue with little pops of green is perfect. Gorgeous! Your work is truly an inspiration! I just love the look of Kraft with black and white...its a can't miss in my book. I think the handwritten set was made for the wreath builder! Oh I love the white coloring on white embossing!! Simply beautiful!! Love the white on kraft! Another great idea for this stamp! And can’t wait to see all of Emily’s set! Thanks for sharing! Love the color combo on the first card, love white on kraft. I have the wreath builder set, now just have to wait to order the handwritten set. Thanks for the inspiration. Beautiful cards! I love the white on Kraft. I love the white on kraft...Ive never done it before but seeing it here gives me the inspiration to try it..Thank you for sharing your beautiful card..
Love your cards. White on kraft looks awesome. These are beautiful! I love the color combinations you used. Two beautiful cards Susie! I also love white on kraft and the flowers do look like they are made from vellum. Your second card is gorgeous with the wreath builder and Emily's new set. Subtle beauty!! Love these cards. Oh my...that flower in white is stunning! Beautiful cards! White on white, I never thought of doing that. Beautiful. Beautiful cards!! The blue pops right off the page on the wreath. These cards are simply gorgeous Susie! Love them both! Your cards are gorgeous. The first one is very elegant! Lovely presentation of the sentiments!!! love the you make me smile card. Made me think of using bleach....Beautiful, elegant. Beautiful cards. The wreath is perfect for the sentiment. Love the combination of natural cardstock with white embossing. Looks very elegant. Very pretty cards. I like the white on kraft on the first one. Such pretty designs! Love the softness of the white flowers and the wreath is fabulous! Just beautiful! I love the feathery look on the wreath builder card. Lovely cards! I really like how you made the wreath to let the sentiment take center stage. Beautiful cards! I love white embossing on kraft and your wreath card is so soft and lovely! Love the white on craft card is lovely. Thanks for sharing your lovely work. The white flowers on the craft card stock are very pretty! I'll have to try that! Fabulous cards! The white on kraft really does look like vellum - nicely done! I LOVE white heat embossing on GKD Kraft card stock. This card is perfect! That first card is gorgeous. I thought the flowers were vellum at first...cool technique. Wow - that first card with the white and a bit of black is just stunning. Most of your cards are stunning actually. Beautiful cards! I love your colors too! Thanks for sharing! These are two fantastic cards ! The white and craft combo gives such an elegant look to your first card ! Such beautiful cards...the flowers do look like vellum and so pretty. Your wreath is beautiful with the new sentiments. I like the large size and look forward to seeing them all. Great job. Beautiful cards, I especially love the white on kraft card! I love the simplicity of the colors f both cards. They are lovely. That reminds me!!! I need to make my Mom (who is turning 90 this year!) a Mother's Day card!!! I love what you did! Both cards are very nice. White on kraft!!! !both cards are beautiful!!! Oh my goodness both are wonderful. The second one is so eye catching. Amazing cards! Thanks for the inspiration! Beautiful cards. The blue wreath one is my favorite. both cards are lovely. the blue one is so cheery. Nice work, both your cards are beautiful.